Angry comedy fans have slammed Peterborough Arena for “poor management” of traffic and car parking which led to some missing Billy Connolly’s show on Friday. While many did makes the show, a significant number of people took to social media to complain that long queues out side the arena and confusion with seating inside led to them missing part of Connolly’s performance...and some didn’t make the show at all. 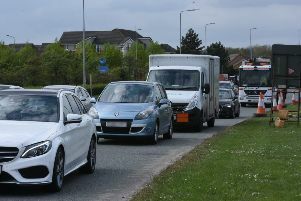 Amanda Davies contacted the Peterborough Telegraph to say: “The roads were completely gridlocked and barely moving. I left home (in Eye) at 7pm and have only just got home, two hours later, and I never made it to the concert! I could have driven to Wembley in the same time! “We witnessed people abandoning their cars and walking!! Julie Eaton wrote on Facebook: “8.30pm and still sat in a queue of traffic, absolutely disgusted! Will be looking for refund without a doubt as will be lucky to see half the show. Actually considering turning round and going back home to avoid the same nightmare to get out. Jason Lunn, General Manager at Peterborough Arena said: “It is a win for the city when we can attract big names like Billy Connolly to the arena. “This was our first big act at the venue and we thank everyone who attended this sell-out event. “We, of course, have to look at what went well and review those areas in which we can further improve. We are proactively looking at how we can fine tune the traffic flow in and out of the venue at our large-scale events. “Outside of the showground it was unfortunate that there were some traffic issues – these were outside of our control and delayed some visitors from getting into the showground on time.